The key to a successful business or practice is to have a well kept and organized record management plan. Document systems that are not kept up to date create headaches and clutter, making it difficult to maintain a productive environment. A well-maintained record management process helps businesses remain compliant with record keeping regulations, avoid security risks, and streamline the overall workflow and productivity of the company. Determining that you need to update your record management system is one piece of the puzzle. Figuring out how you want to organize your data is another. Use this guide to learn the options you have for improving your record management system while helping your company cut down on security risks, costs, and streamline efficiency. Learn more about records management and how to properly utilize it for your document management plan with these articles, blogs, and infographics below! Here are some easy tips you can follow to help you get organized at work, and enjoy the calm atmosphere. In order to feel at ease in your office you should start by organizing your time, and then focus on the work space itself. Although keeping your documents in the office is free, if you add up all the indirect costs, the final bill your business is left with can be quite a bit higher than you initially might think. Find out just how much onsite document storage is costing your company here. While cloud storage is growing trend and now a well-known option for storing documents and information, if you aren’t already considering it as an option for your document management, you may not know what you’re missing. Learn more about cloud storage and it’s various benefits with the help of this handy article. Learn more about how making the conversion to the paperless office and an electronic document management system has improved that ways companies manage records. Get the breakdown on the document scanning process, types of businesses that can benefit from converting documents to digital format, and the impact of electronic document management on record storage. Transitioning to electronic document management offers benefits ranging from efficiency to saving-space, but there are some records you should probably keep as hard-copy. Learn which documents are safe for shredding after scanning, and which you should be hanging onto here. Use this article for a breakdown of the top strategies for improving your paper-based record management systems in the modern business world. Find information on various methods for managing paper documents today, including offsite storage services and document retention policies as well as integrating electronic and paper record management systems for a hybrid approach. With day-forward scanning services, businesses are offered a convenient way to bridge the gap between paper and digital document management systems. Here we take a more in-depth look into the day-forward scanning process, and how it can help your business to make the smooth transition to electronic record storage without losing sight of core business goals. Paper documents and records play a huge role for both homes and businesses, and while other industries are also improving their processes to make paper a more sustainable industry, so too are document scanning and services working to benefit our environment. 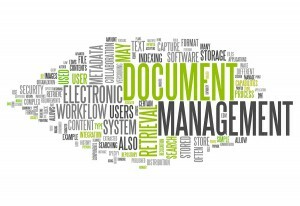 Learn more about how document scanning and electronic records can create a greener way of managing important documents and information here. Electronic document management systems offer fantastic benefits to businesses who need a better way to organize and access their files and records. Discover the ways a DMS can help your business and the simple integrative process when implementing a DMS to your existing systems. If you have any questions about our scanning or storage services already know what you need, feel free to fill out the form to the right or give our experts a call at (866) 385-3706.